This week: absolute disaster, which might have been foreseen. Moses sends out 12 chieftains, a leader from each tribe (except Levi), to get very specific information about the now-nearby land of Canaan. Why? While we read in Numbers 13:1-2 that this was a divine command, 38+ years later, in Deuteronomy 1:20-23, Moses states that the people had demanded it, needing concrete reassurance, which Moses felt a reasonable request. Because of the anxiety of the people, Moses sends the spies out very publicly. They return after 40 days, bearing giant fruit samples and a report of a beautiful, fertile, and unfortunately unconquerable land, populated by giants, next to whom they felt like grasshoppers. Actually, only 10 say that. Caleb and Joshua protest that they can indeed win Canaan, but they are drowned out. The people panic and actually consider appointing a leader to take them back to Egypt (14:4). Kvetching is one thing, but seriously thinking about returning to Egypt at this point? That is the last straw for the Lord. Moses manages to prevent the utter destruction of the people, but they are still punished. Instead of going into Canaan, they will wander for a total of 40 years in the wilderness, until the slave generation, except for Caleb and Joshua, has died off. The 10 other spies die of a plague. Then, a small band, hoping to reverse the divine decision, tries to wage war by themselves, but they are badly beaten. The portion ends with attempts at restoring normalcy, with laws concerning offerings to be made when (not if) they enter the Promised Land, Sabbath observance, and tzitzit. Tzitzit are ritual fringes to be attached to each corner of a four-cornered garment, mostly now seen on a tallit gadol (tallit = the well-known prayer shawl, gadol = big) or dangling visibly from a smaller, poncho-like garment (tallit katan, little tallit) worn under one’s shirt. In the haftarah, Joshua 2:1-24, we see Joshua applying a more successful strategy, quietly sending out just two resourceful spies to infiltrate Jericho and obtain militarily useful information. But is it fair to say Moses blew it and Joshua learned from his mistakes? The situations and populations are quite different. The group Moses sends out consists of well-known, well-respected individuals, but not necessarily the best for this mission; they lacked faith in the Lord and Moses and doubted their future. In fact, almost the whole adult population had doubts, whence the grand fanfare with which the spies are sent out and the disastrous consequences of their negative report. Only a few of them were actually ready to enter the Promised Land. But over 38 years later, outside Jericho, Joshua can send out his spies quietly, because theirs is a purely military mission. This new generation has no doubts. 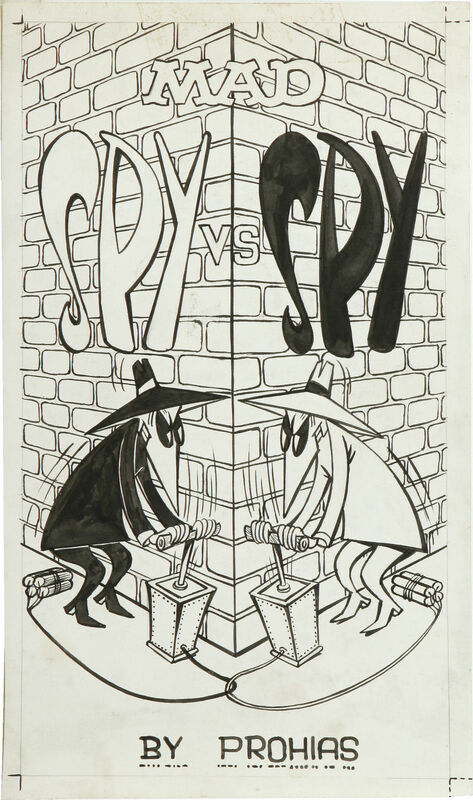 Spy vs. Spy is a wordless comic strip that debuted in Mad magazine No. 60, dated January 1961, and was originally published by EC Comics. The strip was created by Antonio Prohías. Prohías was a prolific cartoonist in Cuba and known for political satire. Prohías’ parodies of newly installed Cuban revolutionary leader Fidel Castro attracted criticism, and faced with the loss of work, possible arrest, and threats of execution, he fled to the United States on May 1, 1960 – 3 days before the Castro government nationalized the last of the Cuban free press. Prohías travelled to the offices of Mad magazine in New York City on July 12, 1960. After a successful showing of his work and a prototype cartoon for Spy vs. Spy, Prohías was hired. Prohías completed a total of 241 strips for Mad magazine, the last appearing in Issue #269 (March 1987). He cryptically ‘signed’ each strip on its first panel with a sequence of Morse code characters that spell “BY PROHIAS”. During an interview with the Miami Herald in 1983, Prohías reflected on his career, stating “The sweetest revenge has been to turn Fidel’s accusation of me as a spy into a moneymaking venture.” Prohías eventually retired due to ill health, and died aged 77 on February 24, 1998. .
What do you call a frog spy? A croak and dagger agent! I honestly have no strategy whatsoever. I’m waiting for that script to pop through the letterbox and completely surprise me. I have on my bookshelf a series of books with opposite titles: ‘The Alpha Strategy’ and the ‘Omega Strategy’; ‘Asia Rising’ and ‘Asia Falling’; ‘Free to Choose’ and ‘Free to Lose’; ‘How to Win Friends and Influence People’ and ‘How to Lose Friends and Alienate People.’ Visitors love the collection. Bring a highly magnified mirror into a place with fluorescent lighting. Ask a child what they think of you and your choices. Think about how much weight you’ve gained in your lifetime. Open the front facing camera on your phone. One of the most aggressive confrontations possible is your own face when you aren’t ready for it. Compare your body to other people’s bodies. Just open a fashion magazine. Calculate the value of your weight in gold. Compare that number to your bank balance. Ask a plastic surgeon what they would do to you. Try on old clothes. Just to check if they fit. They definitely don’t. “Don’t you have any grasshoppers in Texas”? The claimed subject matter provides a tzitzit garment that meets halachic (e.g., Jewish law) requirements for wearing tzitzit strings (e.g., fringes) on the corners of a four-cornered garment. The tzitzit garment includes two layers, including an under layer that is made of compression material that wicks perspiration away from the body of a wearer and an outer layer that is a four cornered garment, has tzitzit strings at each of the four corners and is attached to the under layer. Furthermore, the claimed subject matter provides a pant garment that includes grips to hold the tzitzit strings in place to prevent interference during physical activity. This entry was posted in Uncategorized and tagged 40 years in the wilderness, Caleb, Jericho, Joshua, numbers, punishment, spies, tzitzit. Bookmark the permalink. Yes, Tamir Goodman appears to have been issued a new patent today 24 June 2014 ce. as US Pat. Number 8,756,712; despite my prior art and Rabbi Feinstein’s halachic ruling that such same garments as his — made by me 32 years ago — and shamefully patented today are NOT KOSHER! Please see: http://chassiyot.blogspot.co.il/2014/01/the-great-american-balding-seagle_15.html and http://www.chassiyot.blogspot.co.il/2014/01/the-great-american-balding-seagle_9.html . A real problem exists with Goodman’s garment which I was unfortunately unable to stop from infecting the purchasing Jewish marketplace. The United States Patent Office DOES NOT consider halacha. It acted without full and honest consideration of my known prior art in this field of Jewish garments.